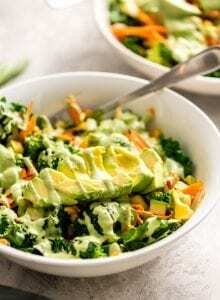 This filling avocado kale salad is topped with the most delicious creamy basil dressing and packed with nutritious veggies. Try it as a salad or stuff it into a tortilla to make a healthy wrap. There are two options for preparing the kale. You can either lightly steam it or massage it with olive oil to soften it. I went with a quick steam by adding chopped, washed kale (so it’s still wet) to a large skillet, covering and turning the heat on for a couple of minutes. It should be slightly softened and a nice, dark green. If massaging it, drizzle the chopped kale with a little bit of olive oil and massage with your hands until softened. Place the basil dressing ingredients into a food processor or blender and mix until completely smooth and creamy. Let it sit while you prepare the rest of the salad. Add all the chopped veggies to the kale. Pour the dressing over the kale and vegetables and mix well. Top each serving with 1/2 an avocado and a few almonds.